Beautiful butterfly - I'm not familiar with butterflies that would be local to your area - however, many of the most gorgeous butterflies are migratory, spending their summers in northern climates, and then retreating to warmer areas for winter. Their only other recourse is to either hibernate, or mate and leave their caterpillars sleeping as pupa, and the adults then complete their life cycle and die. 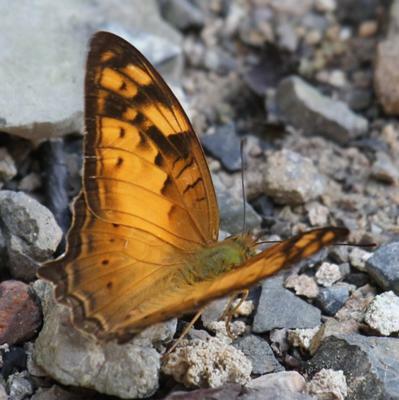 Things to pay attention to when trying to identify butterflies are the edges of the wings, whether notched or scalloped, or smooth, and the shapes and placement of the spots or markings. This one appears to be marked in a similar fashion to some of the larger fritillary butterflies, but they tend to have smooth lower wing edges, not scalloped like this one. I'll keep looking and see if I can pin down exactly which one it is - thank you for sharing this gorgeous insect.